For Tesshin – I Hate Titling Things! Notes: I am actually unsure if comic canon mentions anything to that regard, but in my mostly-anime headcanon, Cross totally helped take care of Tesshin with the rest of her puppies until he was old enough to become all serious business awesome. Credit also goes to this fic for making me want to mention Cross's old family...they never do get addressed again, and who better to check up on them painlessly than a ninja? Tesshin balances his loyalties as adeptly as his paws on a ledge; when Weed needs him and his elders do not, he helps protect Ohu, the dogs' paradise. When the Koga clan requires his strength, he is there and Weed understands. There is a time, once a year, where it might seem he follows neither—he leaves whichever home he is pledged to, runs through the night, rests during the day in trees and on roofs. He finds four places, in three cities...the first time, he had to search, but his sense of direction is as unerring as his devotion. None of the white-haired dogs he sees bark or raise fuss. To them, he's merely a passing shadow, flitting through residential neighborhoods more suiting pets than ninja. He need only confirm one thing, and move on. Finally, he heads to the home that raised him. Not Koga, which birthed him, or Ohu, which trained him, but to the dog who took him in when he'd been abandoned by his blood father. He might have Gin's commanding prescence, John's strength, and Akame's swiftness (and he might bear Kurojaki's blood and craftiness), but Tesshin remembers Cross like a mother. She taught him to hunt, and he chased rabbits and birds through the grass with his siblings on his tail and her protecting them all. His brothers still call him little when he's the oldest, but...well, Kogas do not grow like Salukis or Danes. 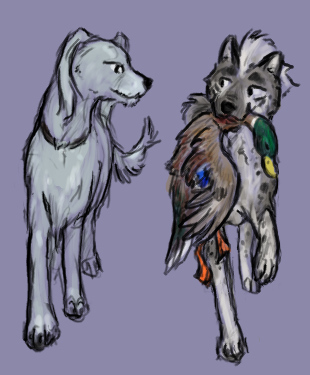 Tesshin takes a bird with him, too, a duck snatched from a park pond and grown fat on human feedings. When Cross still fought, a meal was an easy excuse to visit without the others passing judgement on her—he'd trot past other soldiers with families, hear what a good child he was, bringing his mother such a fine prize, why didn't you bring me lunch? Now, Cross runs slower and doesn't hunt the tastier critters: "these old legs can still jump, don't you forget", she teases the pack's little ones when they play at chase, but Tesshin can see her wince once they've settled down for a nap. She and Ben can eat well today. And then they settle down and talk of the family they both are willing to remember, of how the world is running and who's running what and everything else normal. Come night, Tesshin is off again.